[223 Pages Report] Fresh food packaging protects food products from environmental conditions and physical damage; it provides consumers with information regarding the ingredients and nutritional value; and more importantly, it helps maintain the quality of food as per the predetermined standards. Fresh food packaging is made of materials such as polyethylene, paper, aluminum, BOPET (Biaxially-oriented polyethylene terephthalate), and poly-vinyl chloride. The global fresh food packaging industry mainly deals in meat & meat products, fruits, vegetables, and seafood. The need for convenience food and extended shelf life to supply fresh food has attracted significant demand in recent times. The primary goal of fresh food packaging in many countries, is emphasizing on reducing the waste material and tamper detection facility to ensure that the provided service meets the predetermined standard protocol. The fresh food packaging market has been growing in accordance with the packaging industry. With increasing awareness about global warming and concerns about the environment, the packaging industry is opting for eco-friendly techniques of packaging such as the use of recyclable packaging material, which has had an influencing impact on the market for global fresh food packaging in terms of increasing the demand of packaged fresh food. This report estimates the market size of the global fresh food packaging market in terms of value (USD billion). In this report, the market is broadly segmented on the basis of package material, pack type, application, and region. Market drivers, restraints, challenges, raw material, and product price trends are discussed in detail. Market share, by participant, for the overall market is discussed in detail. The global fresh food packaging market has grown exponentially in the last few years and this trend is expected to continue. Increasing awareness about the health concerns and innovations in eco-friendly packaging techniques drive the growth of the fresh food packaging market. 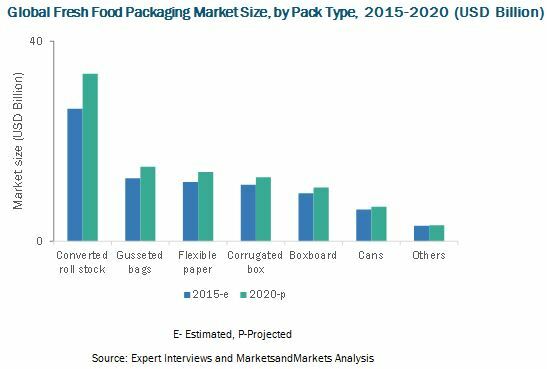 The global fresh food packaging market is projected to reach USD 95.91 Billion by 2020, at a CAGR of 3.38% from 2015 to 2020, which signifies a steady increase in the demand for packaged food. The fresh food packaging market has been growing in accordance with the packaging industry. 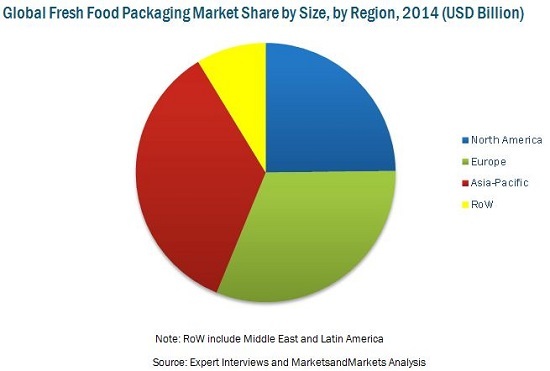 The increasing population, increasing incomes, increasing demand for convenience food, and the extended shelf life of packaged food are the main drivers for the fresh food packaging market. The converted roll stock segment is projected to grow at the highest CAGR of 4.79% during the review period, that is, from 2015 to 2020. The global fresh food market is marked with intense competition due to the presence of a large number of both, big and small firms. New product launches, mergers & acquisitions, partnerships, and expansions are the key strategies adopted by market players to ensure their growth in the market. The key players in the market are Amcor Limited (Australia), Coveris Holdings S.A (U.S.), Smurfit Kappa Group (Ireland), E. I. du Pont de Nemours and Company (U.S.), Mondi Plc (South Africa), Bemis Company, Inc. (U.S.), International Paper Company (U.S.), D.S. Smith Plc (U.K.), Silgan holdings Inc. (U.S.), RockTenn Company (U.S.), and Sealed Air Corporation (U.S.). 12.9 E.I. Du Pont De Nemours and Co.